Lion's Mane: A Mushroom That Improves Your Memory and Mood? Mushrooms provide a vast array of potential medicinal compounds. Many mushrooms are well-known for these properties, but the lion's mane mushroom, in particular, has drawn the attention of researchers for its notable nerve-regenerative properties. Mushrooms provide a vast array of potential medicinal compounds. Many mushrooms -- such as portobello, oyster, reishi and maitake -- are well-known for these properties, but the lion's mane mushroom, in particular, has drawn the attention of researchers for its notable nerve-regenerative properties. Lion's mane mushrooms are increasingly sold by gourmet food chains. This nutritious mushroom is roughly 20 percent protein, and one of the few that can taste like lobster or shrimp (Stamets, 2005). Lion's mane is best when caramelized in olive oil, deglazed with saké wine, and then finished with butter to taste. Lion's mane can be bitter if not cooked until crispy along the edges. It takes some practice to elicit their full flavor potential. 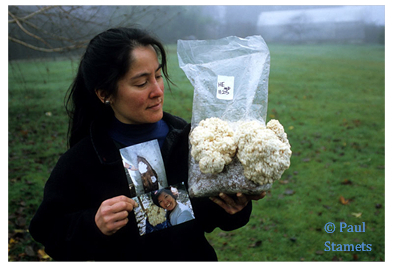 Lion's mane mushrooms are increasingly studied for their neuroprotective effects. Two novel classes of Nerve Growth Factors (NGFs) -- molecules stimulating the differentiation and re-myelination of neurons -- have been discovered in this mushroom so far. These cyathane derivatives are termed "hericenones" and "erinacines." The levels of these compounds can vary substantially between strains, based on the measurements our team has conducted. Recently, mice were injected with neurotoxic peptides in an experiment to assess the effects of lion's mane on the type of amyloid plaque formation seen in Alzheimer's patients. The mice were then challenged in a standard "Y" maze, designed for testing memory. Mice fed with a normal diet were compared to those supplemented with lion's mane mushrooms. As the peptide-induced plaque developed, the mice lost the ability to memorize the maze. When these memory-impaired mice were fed a diet containing 5 percent dried lion's mane mushrooms for 23 days, the mice performed significantly better in the Y maze test. Interestingly, the mice regained another cognitive capacity, something comparable to curiosity, as measured by greater time spent exploring novel objects compared to familiar ones. The reduction of beta amyloid plaques in the brains of mushroom-fed mice vs. the mice not fed any mushrooms was remarkable. The formation of amyloid plaques is what many researchers believe is a primary morphological biomarker associated with Alzheimer's. Plaques linked to beta amyloid peptide inflame brain tissue, interfere with healthy neuron transmission, and are indicated in nerve degeneration. The medical community is bracing for an increase of patients with Alzheimer's and senile dementia as the baby boomer population ages. Mortality trends related to Alzheimer's are outpacing death rates of many other diseases. This makes preventive and curative treatments of age-related cognitive diseases hot subjects of research. In the past 10 years, deaths from Alzheimer's disease have surged roughly 66 percent, while deaths from other primary diseases have generally declined. The influence of lion's mane influence on neurological functions may also have other added benefits -- making you feel good. In another small clinical study (n=30), post-menopausal women who consumed lion's mane baked into cookies vs. those without showed less anxiety and depression yet improved in their ability to concentrate (Nagano et al., 2010). Dusty Yao with lion's mane cultivated three months from the time the wild specimen, featured in photograph, was collected. Is this data conclusive thus far? No. Is this data suggestive of positive outcomes? Absolutely. In another small Japanese study with a randomized sample of 30 women, ingesting lion's mane showed that "HE intake has the possibility to reduce depression and anxiety, and these results suggest a different mechanism from NGF-enhancing action of H. erinaceus." (Nagano et al. 2010). 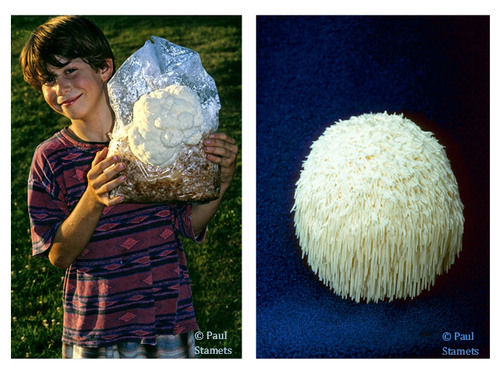 In light of the numerous diseases related to neurodegeneration, lion's mane deserves more clinical attention. If lion's mane enhances memory and is an antidepressant, can consuming this mushroom alter the course of Alzheimer's and other neurodegenerative diseases? Could this mushroom help Parkinson's patients or those with multiple sclerosis, or maybe maintain your mental acumen as you age? Lion's mane is a relatively inexpensive, easily-cultivated fungal food that may prove to be therapeutic in ways beyond being tasty. Left: Fresh, organically grown lion's mane ready for sale. Right: Close up of spore-producing spines. *Hedgehog is a name more commonly associated with Hydnum species, specifically the edible Hyndum repandum. **Before consuming any wild mushroom, make positively sure that it is accurately identified. For a list of mycological societies, which may be able to help you, go to the North American Mycological Association website: www.namyco.org. Kawagishi, H., Ando, M., Sakamoto, H., Yoshida S., Ojima, F., Ishiguro, Y., Ukai, N., Fukukawa, S. 1991. "Hericenone C, D and E, stimulators of nerve growth factor (NGF) synthesis from the mushroom Hericium erinaceum." Tetrahedron Lett 32, 4561-4564. Ma, Bing-Ji , Jin-Wen Shen, Hai-You Yu, Yuan Ruan, Ting-Ting Wu & Xu Zhao, 2010. "Hericenones and erinacines: stimulators of nerve growth factor (NGF) biosynthesis in Hericium erinaceus." Mycology: An International Journal on Fungal Biology. 1(2): 92-98. Mori, K., Inatomi, S., Ouchi, K. Azumi, Y and Tuchida T. 2009. "Improving effects of the mushroom Yamabushitake (Hericium erinaceus) on mild cognitive impairment: a double blinded, placebo controlled clinical trial." Phytother Res. 23:367-372. Mori, K., Obara, Y., Moriya, T., Inatomi, S., Nakahata, N. 2011. "Effects of Hericium erinaceus on amyloid β(25-35) peptide-induced learning and memory deficits in mice." Biomed Res. 32(1):67-72. Nagano, M., Shimizu, K., Kondo, R., Hayashi, C., Sato, D., Kitagawa, K., Ohnuki, K. 2010. "Reduction of depression and anxiety by 4 weeks Hericium erinaceus intake." Biomed Res. 31(4):231-7. Stamets, P., "Notes on nutritional properties of culinary-medicinal mushrooms." International Journal of Medicinal Mushrooms. 2005; 7:109-116. Thal, L.J., Kantarci, K., Reiman, E.M., Klunk, W.E., Weiner, M.W., Zetterberg, H., Galasko, D., Praticò, D., Griffin, S., Schenk, D., Siemers, E. 2006. "The role of biomarkers in clinical trials for Alzheimer disease." 20(1):6-15. For more by Paul Stamets, click here. For more on natural health, click here.